Announced this fall at the AES convention in New York, the Shure SRH1540, premium, closed-back headphones offer superior listening and monitoring for the professional engineer, musician, or music fan, with form and functionality that will provide years of pleasurable use. The SRH1540’s come with a large, heavy-duty carrying case that accommodates the headphones, as well as a replacement cable, spare ear pads, and a threaded ¼ inch adapter. Everything in this package is quality. The ear pads feature an Alcantra covering (an alternative to suede, with a velvety feel), and the cable is reinforced with Kevlar to increase durability and add a weight that resists tangling. The cables are detachable, for easy replacement and ease of portability. The construction of the headphones, which employs carbon fiber and aluminum alloy, is both durable and visually striking, while contributing to a lightweight design (10.1 ounces) that resists internal resonance. The SRH1540’s are extremely comfortable. The Alcantra covered foam ear pads fit around your ears nicely, and grip with just the right amount of pressure. Though a bit warm, the pads are perforated, and breathe more than most vinyl or leather ear pads while still providing decent sound isolation. The acoustic performance of the 1540’s is brilliant. Powered by 40mm neodymium drivers, the frequency response is natural, with just the right amount of hype on the low end. 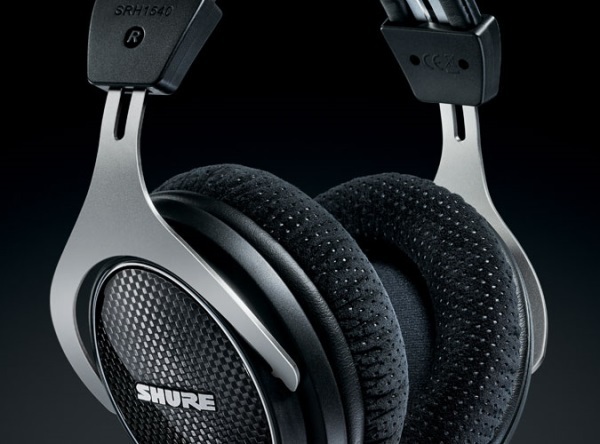 At various listening levels, with different styles of music, the Shure 1540’s performed well. The clarity, balance, and detail, are what you’d expect from a premium set of headphones, and are best observed when listening in a quiet environment, though when used mixing in a club during our tests, the SRH 1540’s were beyond adequate.